The bottom of Sonic's arm is weirdly huge, but otherwise, it's a lovely image. however, I't just an edit from Yarharhar's example, so credits goes to him. Wow, Yarharhar's Sonic has really proven his point. It really retains the game's style, and even resembles the Sonic at the title screen. Great job, dude! -even the light and shadows a little, since the left sock seems to be a little bright, and his right glove is a bit too dark. EDIT: really big version here. You know, if I was controlling a highres Sonic that looked like this (The far right one), I'd probably bleed pure happiness everywhere. WANT. Total win. Even though I always found the buckles rather ugly and unnecessary but that's probably just me. 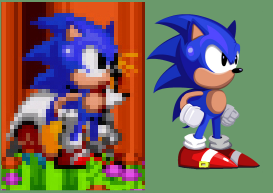 Don't you think Sonic looks more like the Sonic 2 one without the mouth? I must say that, while Yarharhar's method works wonders with characters when done correctly, since they're supposed to be kind of cartoony (or "spritey", whatever), on the other hand, the levels themselves were always supposed to look hi-tech-like, filled with polygonal elements (palmtrees in Green Hill), CG stuff (corkscrew EHZ thingies, barrels, plants in Chaotix), and even holographic things (translucent plants in Star Light and palm leaves in EHZ, squared globe bushes in Emerald Hill) so, at least for backgrounds or objects in general, I'd go with CG. Also, alpha blending would be needed to achieve some of the original effects (for example, the cylinders in Marble just need some transparencies). Badniks might be considered as "alive" (from the many expressions they've shown in specific moments, and the way they look in the manuals), so I'd go for the cartoony look for them too... although this might also depend on each game, since Sonic 3's look more CG-like, but we're talking about Sonic 2 here anyway. Er, I don't think it'll be needed to redraw stuff from scratch completely ignoring the old graphics... I would scale them up, and then take them as a base for the new graphics. Speaking of this, how many times do you need to upscale an old MegaDrive sprite to make it HD? EDIT: That HD Sonic looks BEAUTIFUL. Kudos, man! Hmm, I think that Sonic has a bit too many inbetween colors. Yarharhar's method made Sonic look more like he was taken from an animation cell. On the other hand, the backgrounds do indeed look quite good this way, with all the light and shadows you can put. I think that having this difference between cartoony characters and elaborated backgrounds could make Sonic and Co stand out more. EDIT: Here's an edit of AlchemistDefined's Death Egg pic with the other Sonic, for the curious. That's it, concept art than Adobe Illustrator CS2 for vector paint. Whoa, that's pretty awesome! What I'd suggest is filling the color gaps better with some sort of gradient, and getting rid of that smile—Super Sonic looks badass, not cheery with a pedosmile. Project:Part of Team Megamix, but haven't done any actual work in ages. Edited Vincent's sprite to remove the cheery smile. Now if only there was a way to add a glowing effect to him ingame, because I doubt that the glowing pallete will effect him. New smile, shades, gloves and fix on head dimension. I'll need to retouch some color, then I'll move onto next frame.